2. Open x-terminal, and issue command example below to edit squid configuration file using gedit editor. [fedora10@fedora ~]$ su -c "gedit /etc/squid/squid.conf &"
3. 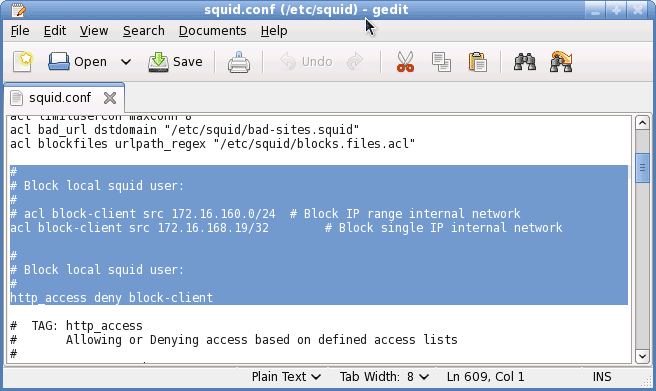 Add the configuration line below in squid.conf (acl section), but make sure you edit the IP Address that need to block base on your network configuration. 4. Save squid.conf and exit the editor. 5. Reload squid configuration file to to make sure that squid proxy server using the new configuration. [fedora10@fedora ~]$ su -c "service squid reload"